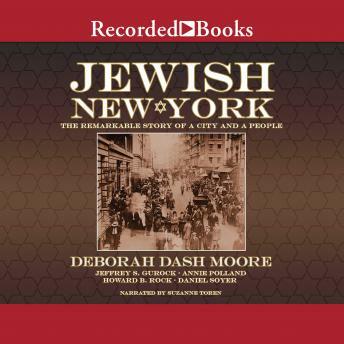 The definitive history of Jews in New York and how they transformed the city Based on the acclaimed multi-volume series, 'City of Promises: A History of the Jews of New York,' Jewish New York reveals the multifaceted world of one of the city's most important ethnic and religious groups. Spanning three centuries, Jewish New York traces the earliest arrival of Jews in New Amsterdam to the recent immigration of Jews from the former Soviet Union. Jewish immigrants transformed New York. They built its clothing industry and constructed huge swaths of apartment buildings. New York Jews helped to make the city the center of the nation's publishing industry and shaped popular culture in music, theater, and the arts. With a strong sense of social justice, a dedication to civil rights and civil liberties, and a belief in the duty of government to provide social welfare for all its citizens, New York Jews influenced the city, state, and nation with a new wave of social activism. In turn, New York transformed Judaism and stimulated religious pluralism, Jewish denominationalism, and contemporary feminism. The city's neighborhoods hosted unbelievably diverse types of Jews, from Communists to Hasidim. Jewish New York not only describes Jews' many positive influences on New York, but also exposes the group's struggles with poverty and anti-Semitism. These injustices reinforced an exemplary commitment to remaking New York into a model multiethnic, multiracial, and multi-religious world city. There are some less interesting segments but overall it does an admirable job in telling the story of a race of people settling in a new land over three centuries.